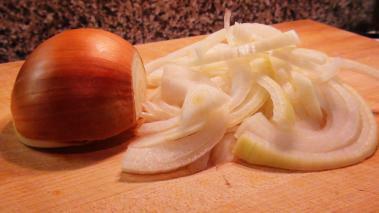 I would guess more than 50% of the dishes I cook call for onions, and many of those for diced onions. Getting proficient at cutting an onion (along with other knife skills) is absolutely essentially, if you want to cut down (pun intended) on your prep work, and spend more time eating. In this cooking video I show you a technique for dicing an onion that is far quicker than what you may be doing today. With just a few cuts you can get the whole onion diced up – either coarsely or finely - in just a few minutes. It’s probably easiest to take a look at the video, as this method is easier shown that explained, but it really is pretty simple and will save you a ton of time, compared to some other techniques.